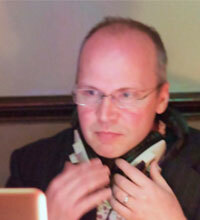 RUPERT TILL is Reader in Music Technology at the University of Huddersfield. He is the person responsible for managing the activities of the University within EMAP. For the EMAP exhibition he is in charge of the creation of two multimedia installations. These are a kind of multimedia time machine or "Soundgate", fusing digital video, modelling and audio in order to recreate an experience of what it felt like in antiquity to hear music and sound in a painted cave, stone circle, or ancient theatre. One installation uses video projection and a recorded soundtrack. A second uses computer game technology and acoustic modelling to create an interactive world. Furthermore, he is curating and producing a series of five albums of music based on work from the project, recording performers and arranging the public distribution of recordings on CD and online. He is a composer and musicologist with specialisms in sound archaeology, archaeoacoustics, popular music, and music and ritual.